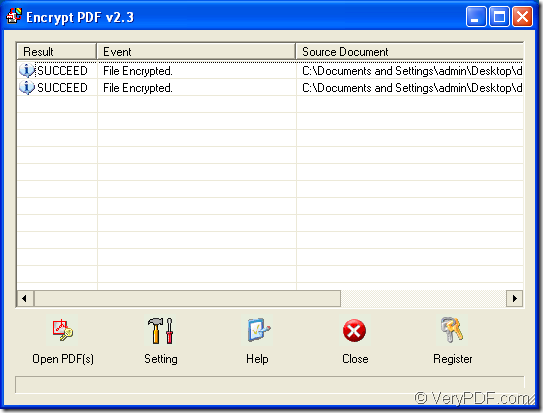 If you want to encrypt pdf document to protect pdf from being freely opened, copied, printed, modified, etc. by those who don’t have authority, you can choose the application VeryPDF Encrypt PDF to help you. 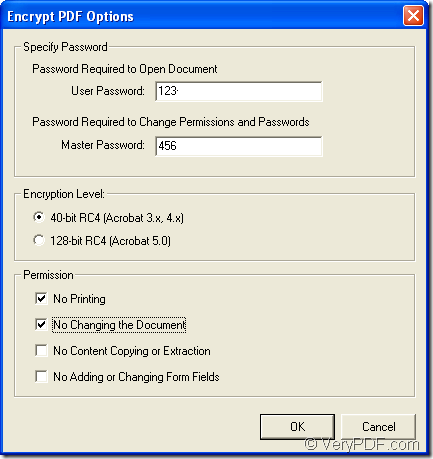 The application Encrypt PDF can be downloaded via clicking here. By double clicking the application icon and following the setup wizard, you will fulfill the installation work for the application. Please open the application by double clicking its icon and you can see the interface of it on the screen like the one shown in Figure 1. Then you need to click Setting button to open Encrypt PDF Options window in which you can encrypt pdf with user password and master password. Please see the window in Figure 2. 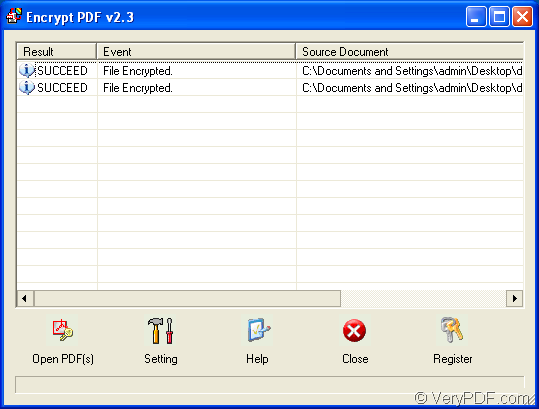 In User Password edit box, you can input the user password for pdf document to protect PDF from being opened freely. In Master Password edit box, you can input the owner password to protect PDF from being copied, printed, etc. You can also choose the password encryption standard as 40 or 128-bit. In Permission group box, you can set different permissions for the document. You can click Open PDF (s) button to open file picker window in which you can choose pdf document to be encrypted. Or you can drag and drop the documents into the application. The window for saving target will pop up instantly. Please choose the output location or input the file name for the encrypted pdf document. With one button click, you can start to encrypt pdf at once. 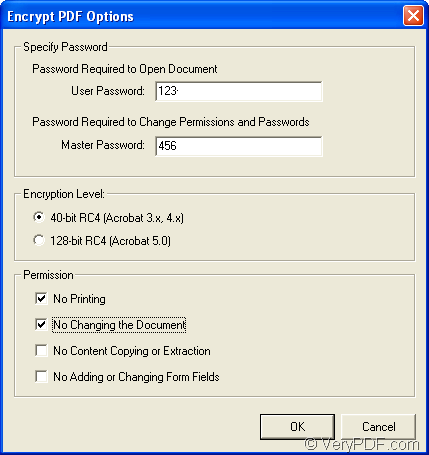 It is easy to use the application Encrypt PDF. If you need to use this application to encrypt pdf document, please enter the homepage of it. Or you can contact our support team when you have any questions about the product. This entry was posted in PDF Security and tagged encrypt PDF, in batch, protect PDF. Bookmark the permalink.